There is no denying that the Old Continent has countless historic buildings that have been turned into luxury hotels but some countries, like Spain, are particularly prone to the charm of a bygone era. A stay at one of the 94 Paradores is one of the most exclusive and beautiful ways to explore the country’s 44 UNESCO World Heritage sites and immerse yourself into Spain’s centuries’ old culture. They are also surprisingly affordable and one of Spain’s best kept secrets. I never understood why more don’t travel through Spain via the Paradores network, so I decided to share this with all of you. May the magic and the history of centuries old buildings embrace you. The Paradores brand was created several decades ago in order to generate income for the refurbishing and upkeep of historical buildings across the country. Conservation efforts extend not only to original art and decorations including painting and sculptures often over 1,000 years old but also in the culinary journey to the time when the property was built. Each Paradores’ restaurant prepares the typical dishes of the area taking guests on a journey to the region’s past and present in beautiful surroundings. In the many Galician hotels, such as Parador de Cambados, you can sample the deliciously fresh seafood that made the region famous. In the Roman city of Aurigis, today’s Jaen, you can feast on blood sausage known as morcilla reminiscent of the city’s bloody attacks by the Moors after being reconquered by The Saint, Ferdinand III of Castille in the 13th century, under a 20 meter cross-vault ceiling. Imagine sleeping under high metal chandeliers at Parador Benavente or strolling back to your room through the narrow passages of a medieval castle on top of a hill at Parador de Alarcon, an 8th century Arab castle turned into a 4* Hotel with 1,300 years of history. Some of the constructions are breath-taking, appearing from behind a hill standing high on mountain tops watching over the land they used to protect. Rooms across Paradores are usually regal, with four-poster beds, velvet bed covers, medieval furnishings and thick stone walls. The common areas are dotted with lances, armory and other defensive items prove of Spain’s belligerent past. The historical value of most of the properties is undeniable. Some were constructed by Kings, Nobles or invaders like the Moors who left their imprint in constructions such as the Parador in Carmona, a city so beautiful that it was compared to the morning star by Julius Ceasar. Parador La Concordia, formerly a 12th Century Castle housing the convent of the order of Calatrava in Teruel, was the location for the meeting of nobles to discuss the heir to the throne when Martine the Humane died in 1410. Their choice of Fernando I marked the beginning of a bright century for Spain. In Parador de Chichon’s main square, Felipe V was proclaimed King of Spain at the end of the War of the Spanish Succession. The mountains were invaded by Romans, Celtics and later on, by the Moors, for three centuries. There are towns, mountains, lakes and rivers to explore and countless legends and stories taught by the locals and passed down through generations. But not all Paradores are in mainland Spain on atop mountains or smaller towns, some of the historical buildings can be found in the Canary or Balearic Islands. The Parador de El Hierro in the island of the same name is located in what was considered, for many centuries before America was discovered, the westernmost part of the World. The Paradores portfolio includes some historical jewels such as the Parador of Cardona, an impressive 9th century fortress sitting on top of a hill. In 986 A.D. it was decreed that the local population could have salt every Thursday in return for one day’s work a week maintaining the fortifications. The fortress includes a Gothic cloister and a Watch Tower built in the 2nd century. The castle has seen many battles in the past and was reputedly attacked by Charlemagne, William the Hairy and Almursur the Moor. From the Parador, the Roman Bridge crossing the river Cardona can be spotted. In former times it was a road much used by the early Christian pilgrims. Some Paradores were entrenched in wars. Napoleon used Parador de Argomaniz in his peninsular wars. The Parador de Alarcon has seen many sieges and revolts. It was founded by the Muslims in the 8th century and was then captured by King Alfonso VIII in the 12th century. From the battlements, the keep and the main tower “Torre del Homenaje” there is an interesting view of the triple defensive walls echoing back to the past. However, the main defence of the castle was its location. It was protected from assault because it is perched on the edge of a ravine with the river Jucar forming a natural moat on three sides as it flows down the ravine. The sights are breath-taking. At Parador de Baiona, in the North-West part of Spain, is hosted in a fortress and became famous for being the port where the first ships returning from the Americas communicated their discovery. Some of the properties were used by Royals as their vacation homes. Emperor Charles V lived at Parador de Jarandilla de la Vera for several months. Parador La Granja was constructed in the 18th Century by Carlos III for the Princesses Gabriel and Antonio. The Palacio Ducal de Lerma was originally built as a place of lodging, rest and general enjoyment for King Felipe III by Francisco Gomez de Sandoval y Rojas, the first Duke of Lerma. 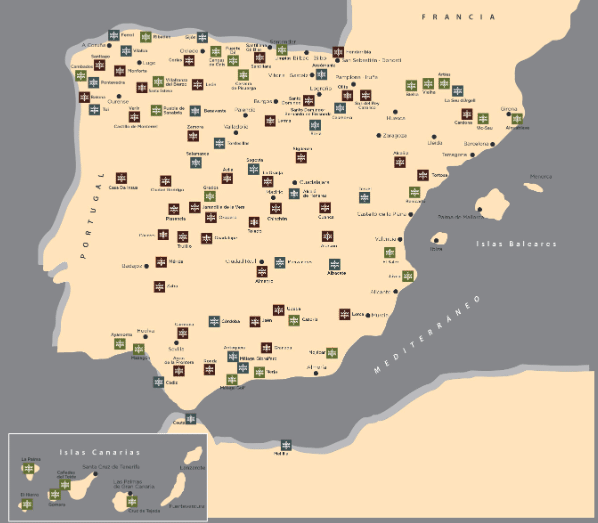 Several Paradores are located in or near Spain’s 44 UNESCO World Heritage sites. The Parador de Alcala de Henares is part of the series of buildings included in the list in 1998. When visiting Caceres, another UNESCO World Heritage town, you can stay at the 14th century Renaissance palace Parador de Caceres. The Parador is extrmeely modern and blends century’s old architecture and interiors of vaulted ceilings and arches with modern furniture and decor in white and brown. From Parador de Corias you can visit Muniellos Nature Reserve, designated UNESCO biosphere reserve in 2000. The Parador de Granada is part of the world famous Alhambra and Generalife Palace complex and was initially a Palace and a Mosque then converted into a Franciscan Convent in the 14th century. La Cartuja Monastery, the cathedral, the Arab baths and Parque de las Ciencias are a few steps away. This is one lace to surely transport you to the times when Arabs and Christians lived in this part of the world and the magic of the Moorish architecture will make you dream. Dine in the cloister with views over the historical buildings sampling Andalusian delicacies like jabugo ham and gazpacho among heritage furniture. Aside from providing an insight into the historically rich Spanish past some of the Paradores are also located in areas of invaluable natural beauty. The Parador of Bielsa in Monte Perdido, the highest mountain range in Spain and UNESCO World Heritage site, is a peaceful base to explore the park. In the Canary Islands, Parador de las Canadas del Teide has impressive panoramic views of the Teide cone, the Chaorra crater and the White Mountain. Staying at a Parador is entering the realm of tales and history books. There are countless places of interest close to the many properties. Near the Hotel Cristobal Colon, in Mazagon, the story goes that Columbus confided in a Franciscan monk from the Monastery of La Rabida at Palos de la Frontera that he dreamed of discovering an alternative route to India. The monk persuaded him to apply to the king for support. Fra. Juan must have been a very enlightened man for, at that time, the church considered the Earth was flat and Columbus would fall of the edge. It was from nearby port of Palos de la Frontera that the three caravels, la Pinta, la Nina and la Santa Maria, set off on their epic voyage. Perhaps one of the Crown Jewels of the portfolio is the Parador de Santiago de Compostela. A mixture of history, art and tradition, it forms a magnificent corner of the main square with the Cathedral in one of the most visited regional capitals in the world. Also known as Hostal dos Reis Catolicos it was originally a Royal Hospital and dates back to 1499. It provided lodging and shelter for the numerous pilgrims making their way to Santiago, an age old practice which continues to this day. It is considered the oldest hotel in the world and it is also the most luxurious in the Paradores network. It has four cloisters and regal bedrooms and suites. Not to mention breakfast overlooking the fabulous cathedral. In modern times new additions to the portfolio are luxurious hotels built next to golf courses, areas of historical interest without old constructions or by the beach. This is the case in Cadiz where a modern Parador provides access to one of the longest inhabited cities in the world where life was recorded 3,000 years ago. For a beach getaway Nerja Parador offers direct access to the beach via an elevator. If you are visiting Spain this is a unique way to sleep in centuries old properties with a history and culinary offer to match. Paradores offers voucher for a few stays and various Cultural Routes to explore Spain. Disclaimer: I have no affiliation or connection with Paradores, this is just my way of sharing a lesser known way to visit Spain that focuses on its rich heritage and history.